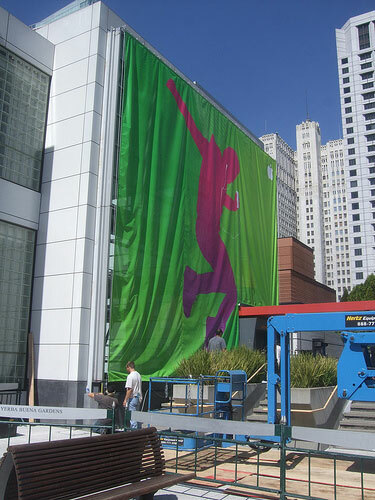 Andrew Mager has posted (via iPhoneSavior) an image from outside the Yerba Buena Center in San Francisco where Apple will hold its "Let's Rock" media event on September 9th, 2008. The large multi-story banner shows one of Apple's iPod silhouette ads clearly suggesting a major iPod-related event. Persistent rumors have predicted that Apple will introduce a tall iPod Nano, a new iPod Touch, as well as iTunes 8. There are also suggestions that Apple could introduce the 2.1 iPhone firmware with some previously unannounced features. - We've heard a few more reports of Apple telling reporters that this event will be a "big deal" and urging them to come. While it's hard to read too much into this sort of hype, it does not appear to be typical practice for Apple. - DaringFireball suggests that there will be iPhone news at the event. - While we won't be providing live web coverage, we will offer links to all available coverage as well as SMS updates via Twitter. - The event will take place on September 9th, 2008 at 10 a.m. Pacific, 1 p.m. Eastern.